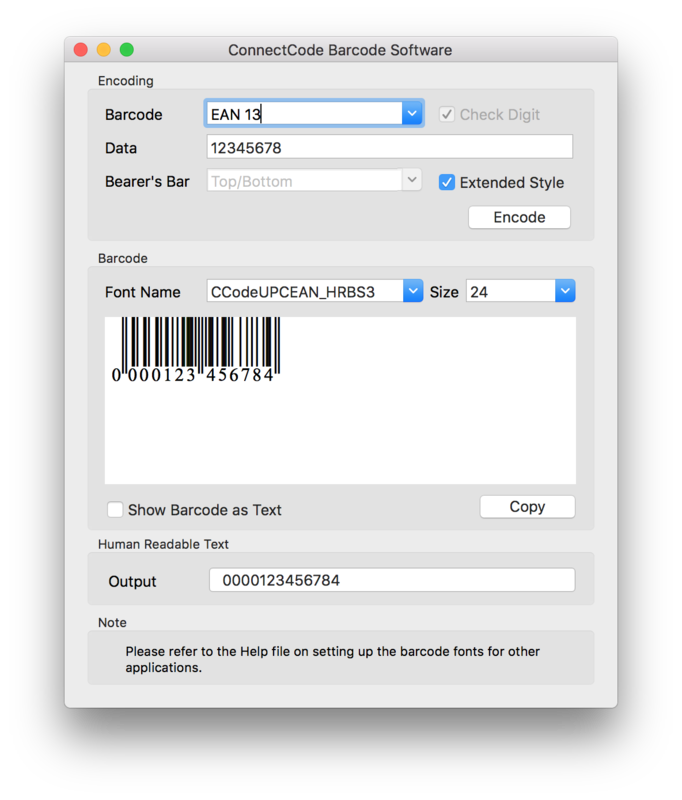 ConnectCode Barcode Software uses computer fonts (Open Type) to create industry compliant barcodes for use on Mac OS X and macOS. Different types of barcodes can be created and easily embedded into a graphics or business document. When a barcode created using a font is printed, it rasters to the resolution of the printer and will not be limited to the DPI (Dots per Inch) of an image. This allows resolution independent barcodes that meet the strictest industry requirements to be created and printed. 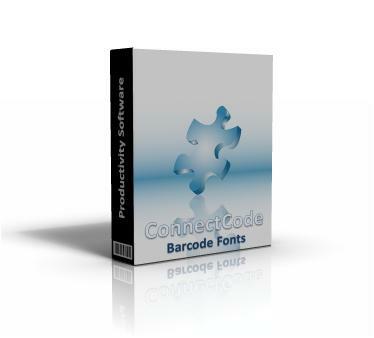 The software uses a highly acclaimed barcode fonts engine developed by ConnectCode. This engine has over the years helped many companies clear their independent barcode verification tests and is now widely adopted by many fortune 500 companies. The font allows for the barcode to be consistantly sized and placed regardless of what data the initial page of the document uses to generate its code. I have used several bar code font applications over the past 20 years and found that ConnectCode is the cleanest solution I have found. The Software was very easy to install and operate. New GS1 Databar 14 barcode! Why should I use your barcode software? Industry Specifications Adherence - One of the most important factor for choosing a barcode font is that it adheres to industry specifications. We have developed and marketed barcode software solutions for many years. Our barcode software is trusted and highly regarded by many fortune 500 companies. We have also helped many fortune 500 companies clear their institution audits and independent barcode verifications. These are vigorous tests and require both expertise and experience. With each test, our products improve in terms of quality and stability. As a matter-of-fact, most of our customers are very happy and very satisfied with our products. They have also been with us for many years. Simplicity - Ease of use has always been an important consideration in ConnectCode. The fonts have been designed in such a way that a user can even specify a barcode by keying in the characters directly as much as possible. 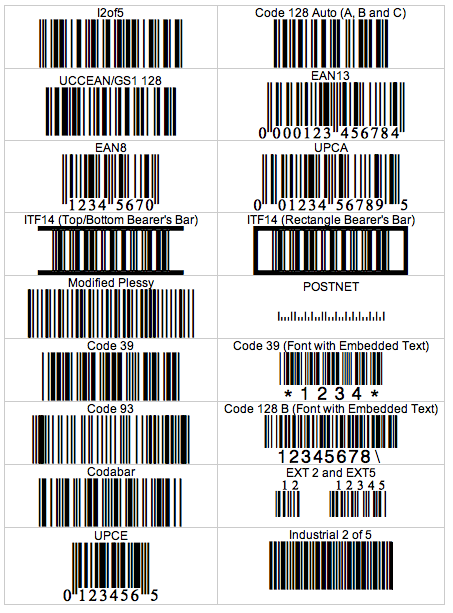 Multiple Barcode Fonts - Most barcodes come with a minimum of 7 different barcode fonts. 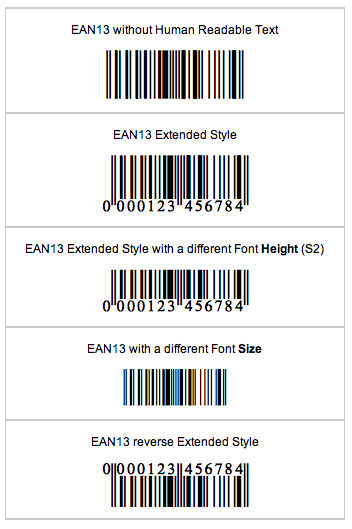 On top of that, some barcodes like UPC and EAN come with human readable text support. Software Encoder - The Encoder helps users create industry compliant barcodes easily by automating the check digit/check character calculation, addition of start/stop characters and parity positioning. No prior knowledge or experience in barcodes is required. Barcode Fonts - The Open Type barcode fonts are part of ConnectCode Barcode Software for Mac. The following industry-proven tools and utilities are available free for ConnectCode Barcode Software's users. Why do I see text characters instead of barcode after copying the barcode to TextEdit? I am getting an extra digit in my barcode. How do I turn it off? How do I create an Extended Style UPC/EAN barcode that appears in a retail packaging in Excel? Important notes on upgrading ConnectCode Barcode Software from OS X to macOS. This is a free version known as Connectcode Lite which supports the Code 39, Industrial 2 of 5 and POSTNET barcodes. This is the professional version that supports all the commonly used linear barcodes (including all major variations) such as Code 39, UPCA, EAN13, Code128, GS1 128, UCCEAN, I2OF5, ITF14 and GS1 Databar. Note : The Trial version contains limited number of barcode fonts and the generated barcodes will have horizontal lines (that do not affect scanning).